Staff at Newton Aycliffe Youth and Community Centre are putting to good use a new cooker that has recently been installed. They’ve taken delivery of the new cooker thanks to a grant from Great Aycliffe and Middridge Partnership (GAMP). Thanks to funding from local county councillors the group were awarded £1,500 to purchase and install a new unit. After years of use the old cooker was no longer fit for purpose or working as it should. The centre and its user groups were beginning to struggle to provide the cooking services required. The new range master style cooker provides a much needed upgrade and will hopefully encourage new users into the centre, who may have cooking/catering requirements. A group who have benefitted greatly from the new addition is the ‘Monday Lunch Club’ who meet every Monday at the centre. For a small fee the club, ran solely by a team of dedicated volunteers, provides a two-course meal every week for over 30 older people. The new cooker is a welcome addition and a great help in providing the quantity and quality of the home cooked food they produce on a weekly basis. Centre manager Beki Metcalfe said: “Having a new, reliable cooker means that the Centre has another room that can be hired to user groups wishing to run catering type courses – from healthy eating to certified food hygiene courses. 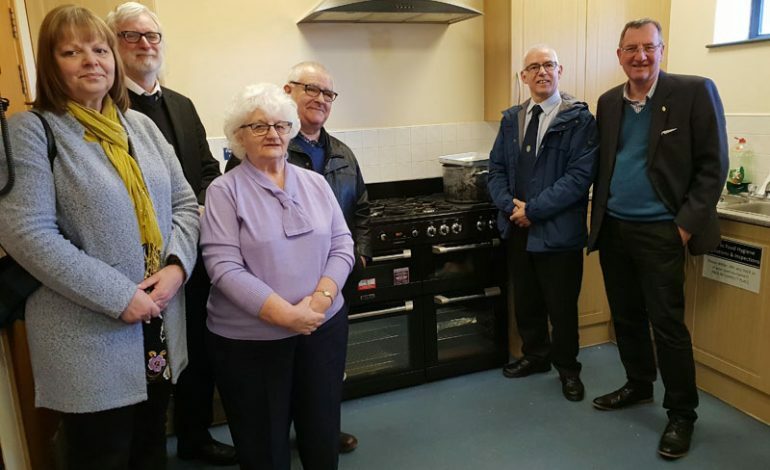 “The Monday Lunch Club volunteers can now co-ordinate the meals better, all of the four ovens work perfectly with even heat distribution, and they feel that they now have a greater range of menus that they can plan for the attendees.